Fifty-eight were killed and hundreds injured in the Oct. 1, 2017, shooting. Oshia Collins-Waters and Todd Wienke were among the thousands of country music fans who descended on Las Vegas last year for the Route 91 Harvest Music Festival. Both survived the shooting that night and 12 days later Wienke proposed. 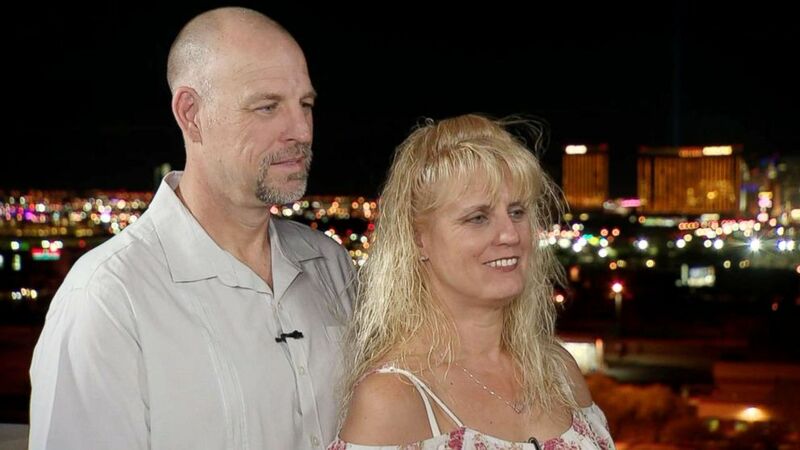 Now, on the one-year anniversary of the massacre, the couple will wed.
"We both knew exactly where [the wedding] had to be -- it had to be Vegas and it had to be Oct. 1," Collins-Waters, 48, told ABC News. She did not want their children to "remember that day as a day they came very close to losing both of us." It's now a "day that our families got bigger," she explained. "[We're] taking back that date." Wienke was shot three times as he shielded Collins-Waters, his then-girlfriend, from the gunfire. The two have worked to overcome the physical and emotional challenges over the last few months, vowing that the tragedy won't "define our lives." (ABC News) Las Vegas shooting survivors Todd Wienke and Oshia Collins-Waters are set to marry in the same city where they had been running for their lives exactly 1 year earlier. 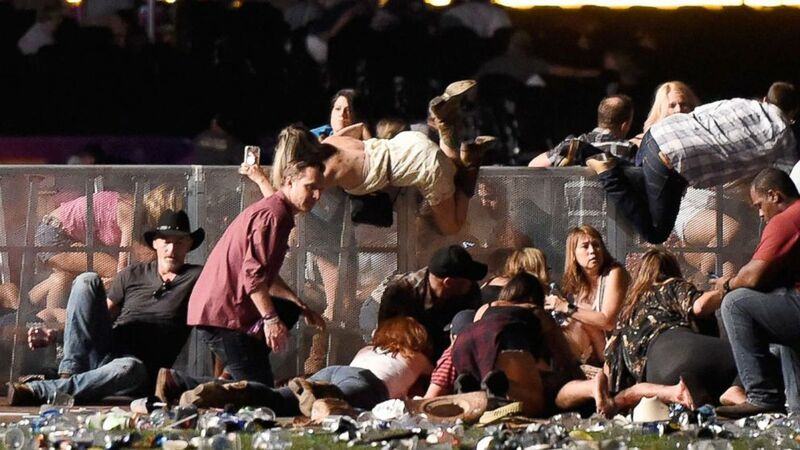 On Oct. 1, 2017, Stephen Paddock opened fire from the 32nd floor of the Mandalay Bay Resort and Casino, spraying hundreds of bullets on concertgoers at the outdoor festival. Paddock later killed himself in his hotel suite. Fifty-eight people were murdered and hundreds of others were injured in what became the deadliest shooting in modern U.S. history. 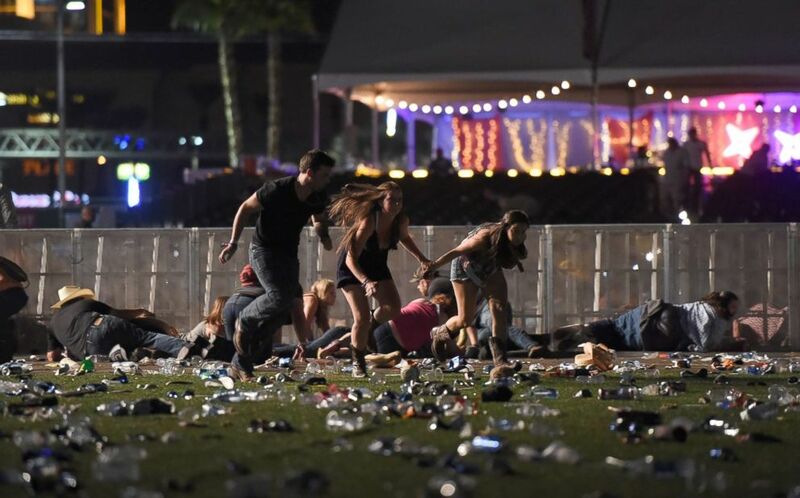 (David Becker/Getty Images, FILE) People run from the Route 91 Harvest country music festival after gun fire was heard on Oct. 1, 2017, in Las Vegas. When the gunfire erupted, Collins-Waters said Wienke shoved her to the ground, telling her to stay down. He then "went on top of me, pulled other people around, not just to protect me but to get them out of the range of fire," she said. When Wienke told her he was shot, she said she pleaded with him, "Please don't die on me tonight." "He said, 'I'm not. When it stops you're gonna get up and we're gonna run,'" she recalled. "And that's what we did." (David Becker/Getty Images) People scramble for shelter at the Route 91 Harvest country music festival, Oct. 1, 2017, in Las Vegas. "The fire rang again and he shoved me to the ground and dove on top of me," she continued. "And that's where he took the second shot." "It feels like fire is going inside your body," Wienke, 49, told ABC News. 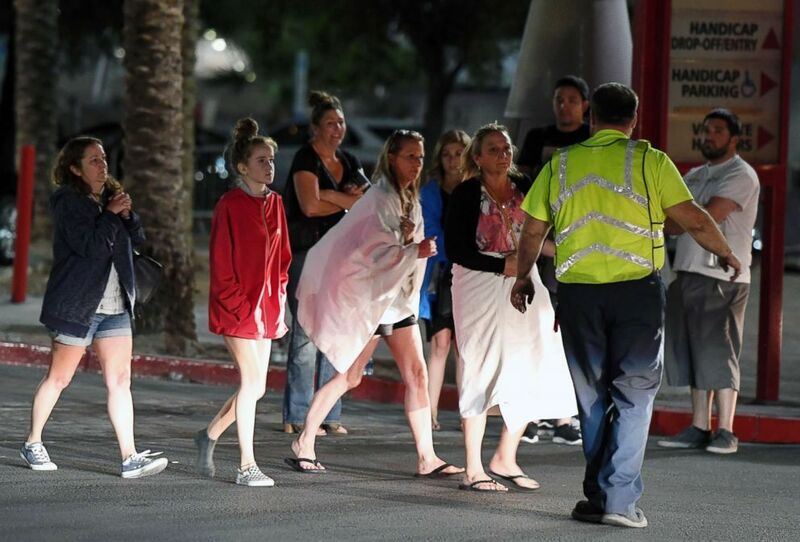 (Ethan Miller/Getty Images FILE) People are directed to rides outside the Thomas & Mack Center after a mass shooting at a country music festival, Oct. 2, 2017, in Las Vegas. Once they escaped, Wienke, a prison officer, was ready to run back in and help more concertgoers. But police told him to seek medical care. The aftermath of the massacre brought physical and emotional challenges for the newly-engaged couple. Wienke said he still has shrapnel in his body and is still in pain. But that it doesn't stop him from living daily life. Collins-Waters said she went to therapy and was diagnosed with Post-traumatic stress disorder (PTSD). She has even called her fiance "the best therapy. Just having him to talk to and to cry on, the support that I got from him even when I would sink... he won't let it define me." "That night is gonna be a part of us for the rest of our lives but it's not going to define our lives," Wienke said. Despite the tragedy, the couple still enjoys visiting Las Vegas and going to concerts. Looking back on last Oct. 1, Collins-Waters said, "The fear of losing him that night is something I never want to feel again. Not knowing if the next step they're gonna take, if they're gonna fall and that's gonna be it, of you're gonna get out of there with them. Todd's my best friend. He's my soulmate, he's my biggest support and my hero." She added, "I'll never forget what I saw that night ... but you, as a person, you control who you become and how it defines you." "He's taught me that," she said, smiling. ABC News' Connor Burton contributed to this report.